1-> How can I reach the Hotel from the Airport? The airport is situated 25km away from the Hotel Premises, although there are taxis and car rentals. The route is quite easy and there are road signs to guide you. 2-> How I can reach the Hotel from the Port? Souda's port is situated 15km away from the Hotel Premises, although there are taxis and car rentals. The route is quite easy, there are road signs and the biggest part of the route is from the Highway. 3-> How far is the Beach from the Hotel? The beach is literally a breath away from the Hotel Premises, in just about 30 meters away. 4-> Are there any water sports in the Beach? There are water sports to be done at the beach, and also there is the choice of extreme water sports for those who seek something different and adventurous. 5-> Is there any room to park my car? Behind the Hotel Premises there is adequate room to park your car, and of course it is provided without extra cost. 6-> Are the Hotel rooms being equipped with a baby coat? All rooms have the option to be equipped with a baby coat , after a request with the Hotel staff, and of course without an extra charge. 7-> Is there any Internet access? A Wi-Fi hot spot is being installed in the Hotel Premises, therefore there is Internet access which is again provided free. 8-> Is there any chance of providing Breakfast? There is a chance of you having Breakfast but with assistance of a neighboring (just 30 meters away) restaurant. 9-> Are there any activities available for my children? There are many activities (such as billiard, outdoor activities, internet cafe's) in the vicinity which will keep your children entertained during your stay. 10-> Are there buses, taxes and Drugstores in a close distance? All of the above are in a very close distance, especially bus stop is 5 meters away and pharmacies and taxes are 100 meters away. 11-> What about overall safety? The Hotel Premises are fully equipped referring to safety and the tourist police is always on duty. Just in case, all of the Hotel rooms are equipped with individual safe box which are provided to the guests. 12-> Where can I buy traditional Cretan products? The vicinity is full of shops that sell Cretan products which for sure meet all needs. 13-> Where can I hear the famous traditional Cretan music? In the vicinity many restaurants and taverns often organize "Cretan nights" and some other various events that will keep you entertained during your stay. 14-> Where can I see museums, churches and Archaeological sites? The area has many tourist and excursion offices that will try to help you with your excursions, also you can try collecting information by yourself or simply asking the hotel staff for further advice. 15-> Where can I ask for excursions? Again, you will find many tourist offices that offer excursion trips but you can also try find what suits you best by gathering information individually or asking for advice from the Hotel staff. 16-> Are there any good and recommended restaurants? There are many good restaurants in the Area which can be found in Tourist Guides, by asking local people or by contacting the Hotel stuff for good affordable options. 17-> Where can I rent a car? There are many car rentals in the area, therefore advice and further information can be found in special advertising brochures or from the Reception Manager. 18-> The final price refers to person or room? The price that have been given to you by the Hotel refers to the daily room price including VAT and nearly alwaysn(if not stated otherwise) including A/C. Thereafter, there is no hidden charge during your stay in Despina Studios. 19-> Are there any folding beds available? To learn this extra option, which comes with very low cost, you have to contact Despina Studios by Email, because on some Room Types this option is not yet available. 20-> Can I make a reservation without Credit Card? 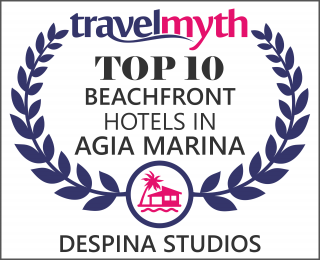 Yes, that is possible, but in your email communication with the Hotel you will be requested to supply Despina Studios with your personal Information as well as a copy of your flight ticket voucher. 21-> What extra charges may I face on the hotel? Usually the only charge not included in the price is the Safe Box or some excursion packets you may buy during your stay. In rare cases A/C is not included in the price but if this happens It will be clearly stated in your reservation form. 22-> Can I pay with credit card? This option is also available, so you can choose whatever payment method suits you best. 23-> Μy arrival time seems to be late in the evening or very early in the morning. What can I do? Despite Check In hours are vast to avoid this kind Of problems, if a guest has an arrival time problem we can arrange an arrival time so as to be someone in Despina Studios in order to welcome him/her. 24-> On my departure date, I want to leave the hotel after midday. What can I do? Despite Check out Hour is set to 12:00 P.M you can stay longer between the day inside the Hotel, since no other booking exists on that day on your room during the day. 25-> Ιs there wire access to the internet? Despina Studios offers free wi-fi to the rooms and in public areas, while if someone wants a more stable/reliable internet access (e.x. for business purposes) there is internet cable also inside the rooms. 26-> Ιs there any discount for long stay bookings? There is a discount on the full amount of booking, for bookings which last more than 10 days, which is Negotiable during your email contact/Reservation with the hotel management.